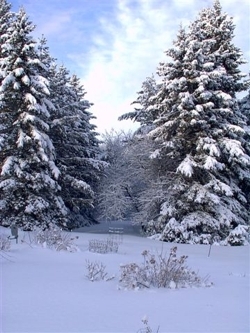 In 1988, we started planting Balsam Fir Christmas Trees which we sell wholesale or choose & cut. We presently have approximately 15,000 trees in the ground on our farm. Since 2008 we have been donating Christmas trees to the "Trees for Troops" program. In 1999, we opened our Deep In The Woods Gift Shop. The gift shop is open by chance or appointment from May through October. During the Christmas season, we are open most every day. We carry some unique handcrafted items from Maine artisans including Judy's own photography and paintings. Judy specializes in commissioned pieces. We also gather nature's bounty to decorate our very own grapevine and twig wreaths. Judy also has a customer base for Memorial Day silk arrangements and more. We are still expanding our perennial gardens for the abundant wildlife we have around us. An abundance of wildflowers are also used in our landscape. The critters just love it! This winter of 2017/2018, our deer herd has been around 50 that we feed morning and evening. We supplement their natural habitat from Dec. 15th thru spring. OxBow is unique in that we have some old growth forest that the deer need to survive in. Aroostook County, located in Northern Maine, is a beautiful place to live and work. The days are long but that's OK. It's worth it!! Our farm is surrounded by natures beauty...the birds, of which the Bald Eagle is making quite a showing these days, give us so much joy. We watched a Barred Owl at midnight one evening hunting on our front lawn. We have documented over 100 species of birds in our yard. Last summer, we had five pair of Eastern Bluebirds that nested in our Christmas tree field. We have a lot of butterflies including the Monarch along with numerous moths and dragonflies. We won't mention the black flies, mosquitoes, and no-seeums...a lot of protein for the birds! The wildlife around our home is amazing. 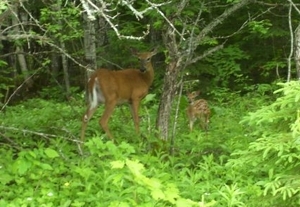 The Whitetail Deer have decided that our raspberry patch is the place to have their babies. Moose are also a common sight along with the Black Bear and Coyote. Plus you wouldn't believe the stars at night, the majestic views including Mt. Katahdin from our Christmas Tree fields, and awesome sunsets! We want to be able to stay here and be self-sufficient by having our own business and employing and/or promoting others so that they can remain in the area as well. If you come to OxBow, you won't be disappointed. The ride in the Fall is awesome! If you want a wilderness experience, take a trip in. The Aroostook River runs right through OxBow. There is a public boat launch for canoers or kayakers. 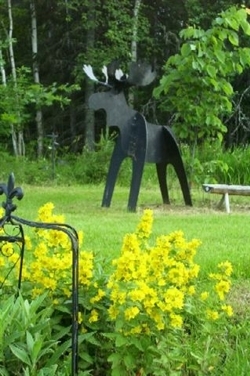 We are a Gateway to the North Maine Woods - OxBow - for hunting and fishing or rustic camping.